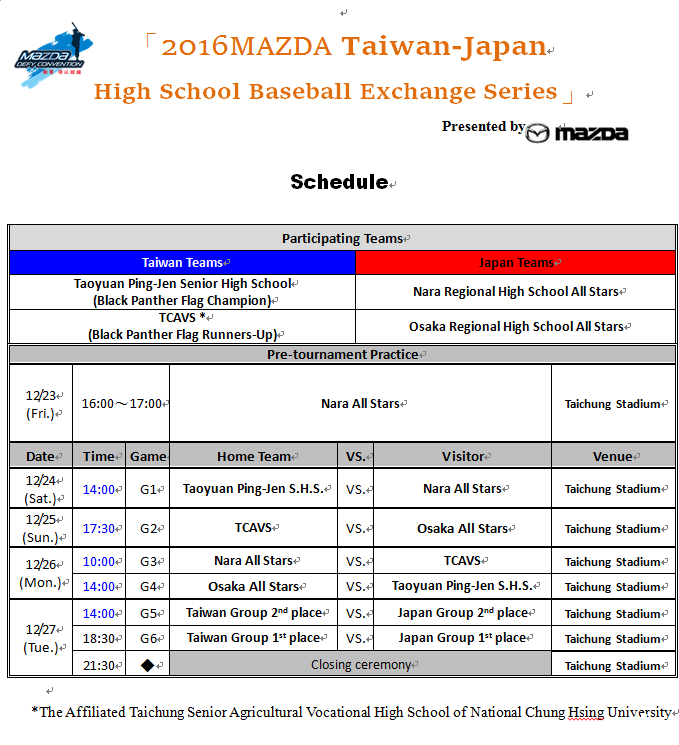 For the two years in row, two high school baseball teams which won the 2016 Black Panther Championship and its runners-up will take on two highly competitive teams from Japan at the 2nd MAZDA " TAIWAN/JAPAN H.S EXCHANGE SERIES", in Taichung for 4 days from Saturday, December 24. Taoyuan Municipal Ping Jen Senior High School won the Black Panther Flag Baseball Championship in 2016 and the runners-up is TCAVS (The Affiliated Taichung　Senior Agricultural Vocational High School of National Chung Hsing University). A half of 18 players in Osaka All-Star team are selected from Riseisha High School, the winner of the High School Division of 47th Meiji Jingu National Baseball Championship in Tokyo in November, 2016 and is lead by Tatsuo OKADA of Riseisha. Leader of Osaka All-Stars is Masahiko TAKENAKA, Secretary General of Japan High School Baseball Federation. 20 member squad of Nara All-Stars is managed by Masaaki KOSAKA of Chiben Gakuen High School, the winner of the spring National Invitational High School Baseball Championship at Koshien Stadium in Nishinomiya, Hyogo Prefecture, in March, 2016. Masao IKEDA, President of Nara High School Baseball Federation acts as Group Leader. At the 2015 High School Exchange Series, two All Star teams from Japan representing Ehime Prefecture and Yamagata Prefecture played against their counterparts in Taiwan.